So many Memorial Day Sales happening right now! 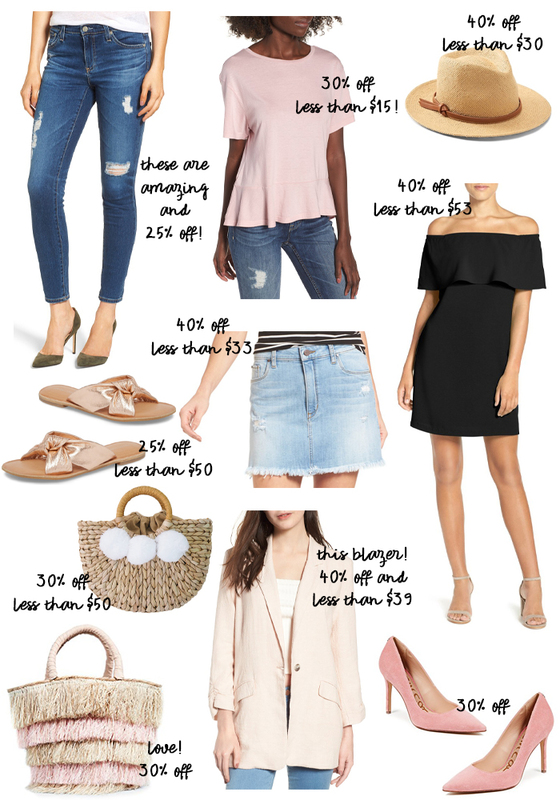 My phone has been going off every couple minutes with a new deal or discount so I've rounded up my favorites to share with you AND ten items I feel are must-haves and won't last long. Versatile pieces and Summer staples that will be well worth your money and you'll be sure to wear over and over and over. You can find each one in the SHOP THE POST section and tons of sales if you read more. I couldn't help but include this darling mini pinata tote with light pink coloring and fabulous detailing. Many straw totes are quite expensive and this one is under $70 with the 30% off sale! You'll also find some beautiful pink lemonade colored pumps in my favorite hue. I own these in hot pink and in leopard and HIGHLY recommend as they fit well and are really good quality. They would look so cute paired with the pale pink blazer! Or with the gorgeous black off the shoulder dress under $53. I've heard so many good things about this piece and sizes & colors are selling out fast! You'll also find my hat obsession 40% off - seriously everyone needs one (I have size sm/m)!